Growing up in the Northeast, I was smitten on road trips south by the idea of oranges or lemons growing in your own yard. Years later, I'm living the dream, with a small but thriving lemon tree that keeps us well-supplied ... through winter. It's wonderful to cut into a freshly picked lemon on Christmas Day, but come summer, when I want to make lemonade by the bucket and plunk perfect yellow citrus slices into pitchers of water and iced tea, my little tree is stubbornly setting out flowers for fall fruit. So in late winter I collect quarts of lemon juice, portioned out and frozen to see me through my summer lemonade needs. 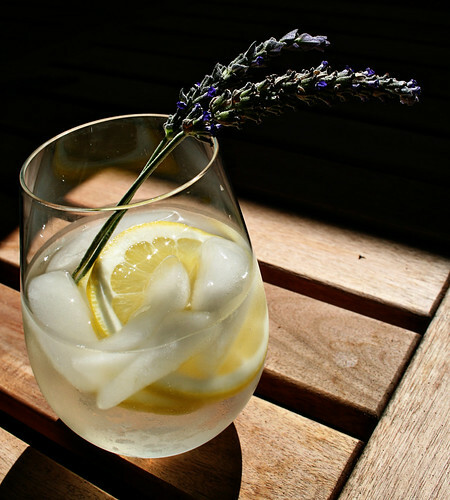 Happily, once summer hits there's a flush of fresh lavender flowers and other herbs to infuse the lemonade. Basil and mint are great alternatives to the lavender in this syrup, and probably easier to obtain. The syrup stores well in the refrigerator, without the lemon juice, and freezes for months. Try adding a splash of the lavender syrup to iced tea or frozen drinks, or use it in baking or sorbet. Be sure to use pesticide-free lavender. Grow your own, clip it from a trusted friend's plant, or find it at Whole Foods or the farmer's market. Alternatively, you can substitute basil, mint, or other herbs. This makes a lightly sweet lemonade, which suits my taste; you may want to adjust the amount of sugar. In a small saucepan, combine lavender, sugar, and 2 cups water over medium heat, stirring to dissolve sugar. Bring to a boil, then cover and remove from heat. Let steep 45 minutes, then strain to remove herbs. Pour syrup into pitcher and stir in lemon juice and remaining water. 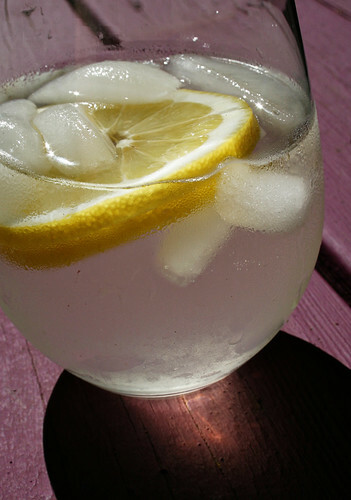 Taste, and add more lemon juice (to cut sweetness) or water (to dilute) to suit your preference. Garnish with lemon slices, if desired, and serve. Hi Little Foodie -- great blog! I'm guessing you're Mariko, and not Damaris, who should have no trouble finding lavender. On Oahu, check out AKL, which is in local stores and the KCC farmer's market, it appears. Culinary lavender can also be purchased through Amazon, of all things, though it's $$$. It never hurts to try sticking a small plant in the ground to see what happens!